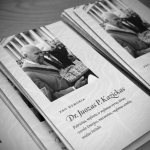 Lithuanian Daily "Lietuvos Rytas" summarized the speech of Jurate Kazickas at the Memorial Evening of Dr.Joseph P. Kazickas in the Palace of Grand Dukes in Vilnius, Lithuania, and posted pictures from the night attended by almost 300 guests, filled with music and great memories. "The family is so grateful that we are in this beautiful place to remember and celebrate the lives of our parents. [...] Palace of Grand Dukes was truly one of my father’s most beloved projects. As you know, the idea was very controversial in the beginning. But it has turned out to be one of the most popular tourist sites in the entire country and that would have made my father very happy and proud. 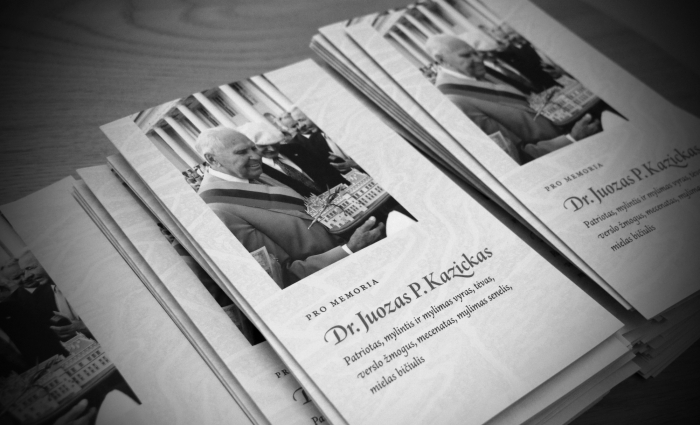 This is the first time in 13 years that almost the entire Kazickas family has gathered in Lietuva.[...] In America this week we celebrate Thanksgiving when families come from all over to be together and thank God for his many blessings. So it seemed like a fitting time for us to have this memorial service. Today has been a very emotional day. My parents are buried in East Hampton where they spent more than 55 summers, along side Alexander Kestutis, our brother who died in 1976 at age 22. But we thought it would be appropriate to bring some of their ashes home to Lietuva, the country they loved so much. Now their remains have a home in the beautiful cemetery of Antakalnis, where so many artists, academics and patriots are at rest. And the family ties to this land are stronger than ever. My father was one of the happiest people I have ever met with a passion for life even with all its challenges. Every day of life was a gift from God. And for all his many successes and talents , he was a simple man who delighted in flowers and sunsets and most of all, family and friends. And of course, music ! Tonight’s program features several young people who benefited from our father’s gifts to the Rostrapovitch Foundation. He felt it was important to nurture new talent that brings glory to Lietuva and we are delighted they are with us tonight . I am of course grateful to all the speakers tonight who will share some of their memories about my father and his beloved partner in life, Alexandra. Most of all, we want this evening to be a joyful remembering of his life. We all know how much my father loved parties. Every special occasion... birthday, anniversary, demanded a celebration with festive meals, flowers, speeches, music. Can’t we still see his smiling, happy face as he greeted his friends. How he would have loved this evening but I really feel he is with us tonight. As he will be with us, in our hearts, forever. " "At the hour that our father was taken from us, our hearts were broken beyond consolation. The fire around which we happily gathered for so long, became a memory in a matter of moments. Those sad emotions that overwhelmed us in early July remain with us today, months later. Joseph P. Kazickas was our fire, but not ours alone. His was a passion that burned for Lithuania as well. His love for his tevyne , second only to his profound love for his beloved Alexandra and the family, was expressed to us by way of an unshakeable belief that Lietuva would eventually find freedom. And he did all he could to help achieve that dream. He was unstoppable. The energy he possessed seemed to have no end. No meeting too bothersome, no obstacle too great, no idea too bold. He used his God given talents – his intelligence, his charm, his sensitivity - to gather people for the cause of a greater good. His was a world of action and love. As he started to slow down and became more burdened by a body that was failing, the fire nevertheless remained. It became a time for us, his family, to more deeply connect to this extraordinary person. And most importantly, to connect with the family roots in Lietuva. Which is why we , his children and grand children, are all gathered here today. Our commitment to Lietuva is unshakable and long-lasting. We are still warmed by the memories of an exceptional man who left a deep mark upon all of us. Let us celebrate his long and extraordinary life."